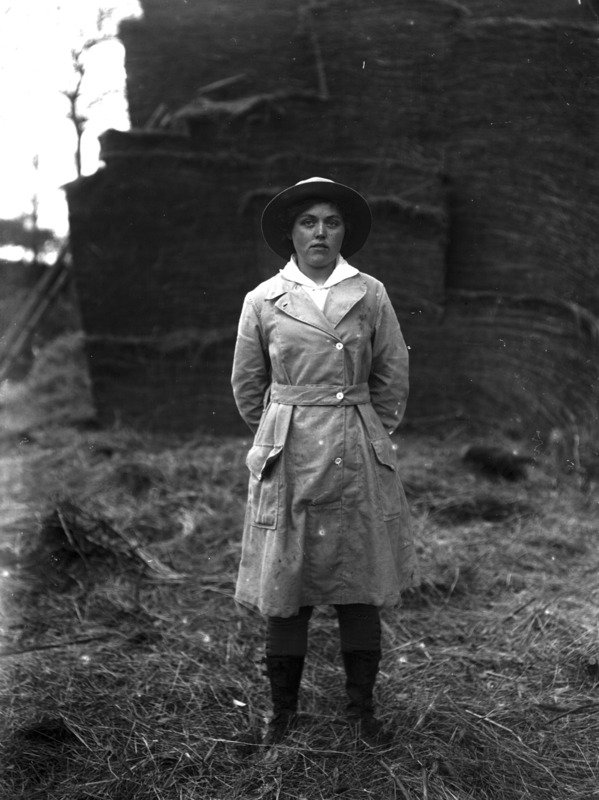 Above: Unknown woman in Cornwall’s Land Army, photographed by Truro-based photographer A. W. Jordan. Click here for a photogallery of Jordan’s work. Winifred May Bennett from Penzance kept an extraordinary diary in 1918. Winifred was a regional secretary for the Women’s Land Army, a network of volunteers set up in the previous year to work on farms as men went off to fight at the Front. Winifred, despite suffering frequently from toothache and ‘neuralgia’, cycled miles around Cornwall, drumming up enthusiasm, training girls, and fighting hostility from farmers who didn’t think that women could or should do gruelling farm work. Winifred targeted local grandees in the effort to recruit large ‘gangs’ of women to help with harvests. She also visited smaller farms where just two or three girls were helping out. Descendants of these farms are in some cases still farming the land there. Sadly we have no photograph of Winifred, but there are many images of the women she worked with as she collaborated with Truro-based photographer A.W. Jordan to document the fantastic effort. Her diary is now in the Imperial War Museum, London. The success of the Women’s Land Army, with an estimated 260,000 women working nationwide by 1918, had a profound effect upon Britain, leading directly to women winning the right to vote in 1919.